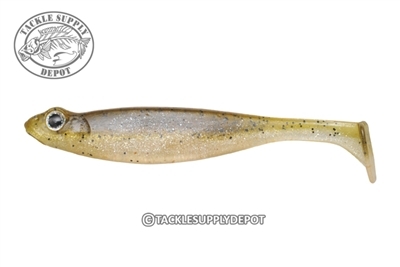 Featuring a delicious profile and carefully layered material of different densities, the Hazedong Shad by Megabass is able to maintain excellent stability even when used with no sinker rigs. This layering process also allows for ultra-realistic two-tone patterns, to fool even the wariest of fish. The super-thin shad tail catches the water even during dead-slow retrieves and delicate shaking, triggering targets with its natural vibrations. This allows the Hazedong Shad to excel where others fall short. The slits in the belly allow the body to compress when bitten, increasing hookup rates. Adding an offset hook helps as well. Fish on a jig head, no sinker rig, or a dropshot; the Hazedong Shad is versatile and appeals to predators of all species.